In today’s crowded world of power struggles and ego trips, the Montessori method serves as a guide to raising unselfish, self-regulated, caring human beings who are problem solvers and have the self confidence to lead successful lives by their own efforts, rather than at the expense of their fellow citizens. The world needs as many people with these qualities as possible to shift the balance away from the good-of-the-few mentality that plagues many cultures today. The world needs Montessori. Why Would You Choose Montessori For Your Child? Every parent has the duty and the choice of determining which qualities they wish to instill in their child. Our habits and our methods of meeting life’s daily challenges inform our children of the ‘correct’ way to live, and they carry these teachings with them into adulthood. Maria Montessori, founder of the Montessori school of thought, firmly believed that young children have incredibly absorbent minds, assimilating all that they see, hear and experience. The child self, and subsequently the adult self, is created from this absorption of total surroundings. By thoughtfully planning the environment in which children live and learn, the Montessori method provides the positive experiences most parents want their children to have in order to grow up with healthy minds, healthy attitudes and healthy life strategies. …then you might wish to choose Montessori for your child. 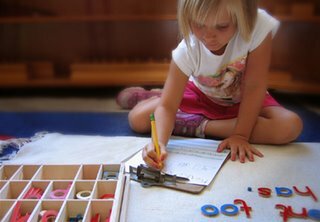 There are two main principles governing the Montessori method. The first is that teachers (be they parents or Montessori directors) must respect children. The second is that children are born with an inherent, natural love of learning. With these two beliefs setting the tone, the Montessori method can be applied both in the homeschool and classroom environment. Over the past century, Montessori educators have developed an excellent set of tools and learning materials that enable children first to develop the basic skills they need to learn effectively, and then to use those skills to acquire knowledge in the areas of language, science, history, mathematics and all of the subjects considered essential to a modern education. Youngest children develop focus, motor skills, methodical habits and a sense of achievement by mastering physical tasks such as sweeping, scrubbing, polishing, and scooping. Sequencing, sorting, and problem solving are made enjoyable with blocks, models and puzzles of all kinds. 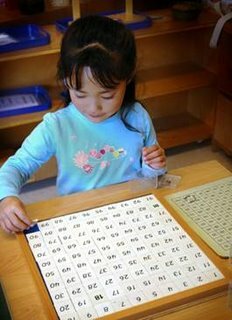 Math basics begin with beads and cards and counters, and language skills improve with movable alphabets and language cards. Music and art play an important role in daily activities, and children investigate the habits of plants and animals. Older children then progress to more complex math, history, science and language arts with age-appropriate tools and materials. Throughout all levels, the child is guided to be orderly and tidy, and to help keep the classroom a good place for all of his/her classmates to work. How is Montessori different than a typical public school program? * The child is the focus of the Montessori classroom, not the teacher. * The child sets his/her own learning pace. Progress is not dictated by the average progress of the class or by school board timelines. * Montessori learning materials are built around controls that signal to the child when he/she has mastered a subject or when more work is needed. This self-governing learning process removes any sense of failure or public shame a child might feel in a classroom where the teacher judges and ranks students against one another. There is no need to compete, only to achieve skills for one’s own sense of accomplishment. * Direction from the teacher is only provided as needed. Beyond this the child is guided to work independently, thus developing the ability to learn effectively on his/her own. * Montessori classrooms are not laid out with desks for student and teacher. The learning environment is carefully constructed of shelves with beautiful materials that the children can choose from throughout the day. * The end goal of a Montessori education is to develop a well-rounded, excellently socialized human being with a rational, inquisitive, well-organized mind. It is this worthy end goal that truly sets the Montessori method apart. Unlike typical public education goals of having a child obtain proficiency in basic subjects considered to be essential by the public school system in order to receive a graduation certificate, the Montessori method focuses on the whole person and his or her need to develop habits and life skills that will serve them well as adults far beyond the classroom setting. If you attended a public school, chances are, you’ve forgotten the majority of the dates, facts and figures that you committed to memory in order to pass your finals. These particles of trivia are unlikely to be playing a major part in your present day life. But the attitudes you developed toward learning, the habits of organization you learned, the very way in which your mind was forming during your formative years is absolutely affecting the way you handle life’s challenges and opportunities today. The Montessori method strives to produce adults who adapt to new situations, learn new skills, and interact with others in a positive, productive way throughout life. Is the Montessori method superior to the average public school method? An earlier study, conducted in 1991 by Alcillia Clifford and Carol Takacs, reached much the same conclusion. In general, Montessori students were more proficient at language arts, mathematics and expressed more positive attitudes towards their schools. This study concluded that Montessori students were more likely than public school students to complete their education rather than dropping out. The success of a Montessori school is largely dependent upon the qualities and gifts of the director and teachers. Some schools will be superior to others. Parents should actively interview and investigate any Montessori classroom to which they might be considering sending their child. Statistics like the above indicate that Montessori-educated children test higher and have better social skills than their public school peers, but it remains vital that the parent choose wisely for the individual child. Why does our world need Montessori? To answer this question, let’s go back to the beginning. Maria Montessori first began developing her methods in the early 20th century while she was training to become Italy’s first female physician. She was assigned to observe a ward of children who had been classified as mentally retarded by the government. These children were being raised without the benefit of outside stimuli or toys of any kind. Montessori saw that the little children were so desperate for activity that they picked up crumbs from the ground and rolled them about in their fingers, just to have something to do. Montessori spent the next few months of her life providing these children with her basic educational materials and at the end of that time, the children were able to pass national tests, and even to test higher than so-called ‘normal’ peers. Montessori learned that adults are prone to underestimate the intelligence of children in general. In today’s world, toys, games and educational materials are dumbed down for the child ‘consumer’ to a never-before-seen low level. We don’t simply give a child a set of wooden blocks or a book. We give him or her flashing cartoons and flickering video games with a deafening explosion per minute. As a result, we have youngsters who are unable to concentrate, focus, play on their own, understand the rights of peers, or pay attention to anything that isn’t being spoon-fed to them via the dubious medium of constant, unceasing entertainment. Oftentimes, parents are shocked to discover that their children become ‘functional’ the moment they are given something interesting, useful and engrossing to do. Meaningless, adrenaline-filled boredom is replaced with purposeful activity and the child is suddenly focused and able to concentrate. Montessori materials provide that ‘something-to-do’ that children so yearn for in their quest to become helpful, recognized, active members of the human family. Concerned adults are shaking their heads over the disorganization, inequality, violence and general chaos of our modern civilization. Psychology has long recognized that our experiences in our formative years dictate a great deal of our adult behavior. The antidote to the rude, selfish adult is the loved, respected child. A system of education that devotes itself to creating a safe, positive atmosphere in which children can learn, grow, achieve, succeed, and come to respect themselves and others gets my vote. The Montessori method is currently celebrating its centennial anniversary. Its contributions to the world – including many thoughtful, responsible, useful citizens – are ones which we can all appreciate. Congratulations, Montessori! May our world continue to benefit from your respectful philosophy for another hundred years.